Showing 47 articles from October 23, 2013. LOUISBURG — Improvements to U.S. 401 in Franklin County have been delayed -- although by how much remains to be determined. The delay results from the change of administrations in Raleigh and from House Bill 817 that created a new statewide funding scheme to apportion dollars to highway projects. After literally decades of effort by Franklin County officials and residents alike, it appeared that U.S. 401 improvements in Franklin County were finally in the foreseeable future. Before last year’s election, U.S. 401 improvements from the Wake County line north to Royal were scheduled for construction funding in October, 2016, with right of way acquisition to be done prior to that date. YOUNGSVILLE — Sheriff’s deputies arrested a woman accused of killing her husband in his sleep Tuesday evening. Charlyn J. Logan, 54, was charged with first degree murder for her role in the death of Wayne Logan, her husband of 30 years. She was expected to have made her first appearance in court on Oct. 23. FRIGHT NIGHT. Louisburg resident Jay Rochester really gets into the spirit of Halloween and figures that decorations at his Noble Street home, like the large black widow spider taking over his front yard, can conjure up some chills. Chill seeking ... or candy hunting? Those looking for chills, or just candy and thrills will have plenty of options this weekend, as well as on Halloween. First, the town of Franklinton will serve as host to its seventh annual Frankenfest on Main, an Oct. 26 street festival celebrating the arrival of fall and the approaching of Halloween. It features food and craft vendors, as well as games and music. The event is slated from 9 a.m. until 5 p.m., rain or shine. In about two weeks, Franklin County narcotics officers have seized more than 900 grams of cocaine and marijuana, resulting in more than half a dozen arrests. • The morning of Oct. 1, investigators arrested Steven T. Campbell, 33, and Wanda E. White, 53, charging them both with felony maintaining a dwelling for the sale of a controlled substance. LOUISBURG — Franklin County and the state worked out an agreement that punishes the county and its director, but keeps shelter doors open. Save for some tweaks, County Attorney Pete Tomlinson said the deal is done. “We don’t like it,” Tomlinson said of the state coming down on the county. 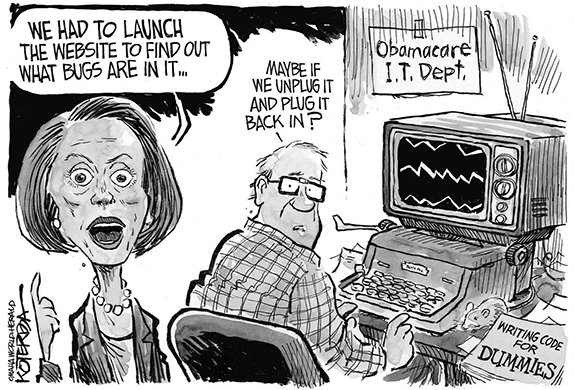 “We think it’s overkill. “... [But] we’re in agreement and we’ll do as they requested,” he said. Both the Louisburg Town Council and Franklin County commissioners got a remedial lesson on the Golden Rule Monday night from no less than a North Carolina Department of Transportation engineer. A 40-year contract? Whose idea was that? What part of this latest dispute didn’t we see coming? When a private company signs a 40-year contract with Franklin County government, can the ending be anything but controversial? At the outset, we should have known this was going to end badly. And now, it’s in the court system and county taxpayers are likely to foot a large chunk of the cost, regardless of how this saga plays out. Fortunately, I can say I don’t understand the mindset of living with domestic violence. I was not raised as a child in a home where domestic violence tore at the seams or threatened to rip the top off of a house. I didn’t have a mother, or grandmother, for that matter, who clinched her hands as time ticked closer to the return home of an abusive spouse. For a number of months, I have been focused on what many believe to be serious problems here in Franklin County — strategic planning for economic development, management/maintenance of facilities, conduct of officials, the preservation of historical documents, and the general posture and direction we are going in. I did not just wake up one morning and pick these topics. Some of you shared your thoughts with me and asked that I consider speaking to them in this column. Late last week, Wednesday night, the House voted to concur with the Senate; once again bringing the American and world economies back from the brink of a manufactured crisis at the eleventh hour. A North Carolina Tea Party/Republican, Mark Meadows, (NC-11), was the architect of this most recent crisis. Who do you REALLY want picking senators? In order to understand the dysfunction in Washington that led to the recent federal government shutdown, one only has to read the Oct. 10 letter to the editor by Roger Lytle, the self-proclaimed facilitator for the organization We The People Franklin County Patriots. Instead of political payoffs, why not U.S. 401? Both major political parties are guilty of pork barrel spending as the result of ending the so-called government shutdown. What are some of the perks lawmakers got? Well, Democratic Senate Majority Leader Harry Reid received over $3 billion to fix a dam. This may well be a worthy purchase. However, there was a recent report of a five-year decline in crime rates in NC, replicated here in our county. ZEBULON - Carita P. Johnson, 58, died Monday, Oct. 21, 2013 at Hospice Home, 200 Hospice Circle, Raleigh. Funeral services will be held at 12 noon Friday, Oct. 25, at New Hope Freedom and Deliverance, Louisburg. Burial will follow in the Nelson Chapel Baptist Church cemetery, Louisburg. 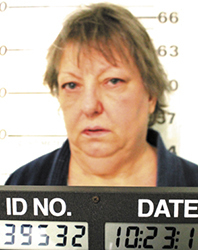 LOUISBURG - Susan Star Cardwell Abbott, 59, died Thursday, Oct. 10, 2013. Funeral service were held Sunday, Oct. 13, in the chapel of Strickland Funeral Home in Louisburg, www.stricklandfuneralhome.net. ALL TOGETHER NOW. Shortly after this photo was taken, Jackson Hooton (left) caught the winning touchdown last Friday for the Franklinton Rams. 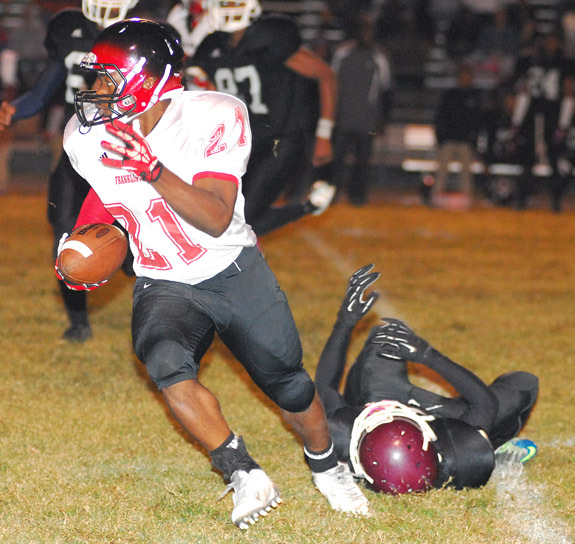 WARRENTON -- Franklinton’s uptempo spread offense and Warren County’s tight-bunch, run-oriented power attack provided quite a contrast during last Friday’s crucial Northern Carolina Conference event at the WCHS Eagles Nest. The back-and-forth battle of wills wasn’t decided until Franklinton quarterback Daquan Neal found Jackson Hooton with a 7-yard touchdown pass with just 19 seconds to play. ACROBATIC. 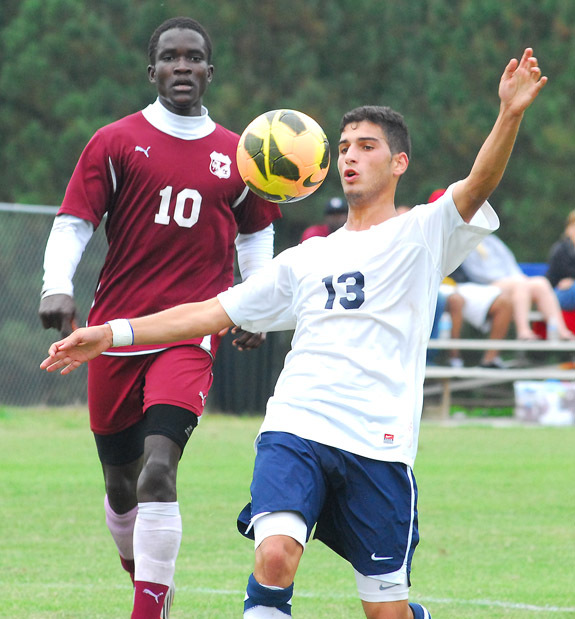 Louisburg College’s Andreas Chrysostomou (13) controls the ball during last Saturday’s home soccer victory against USC-Salkehatchie. 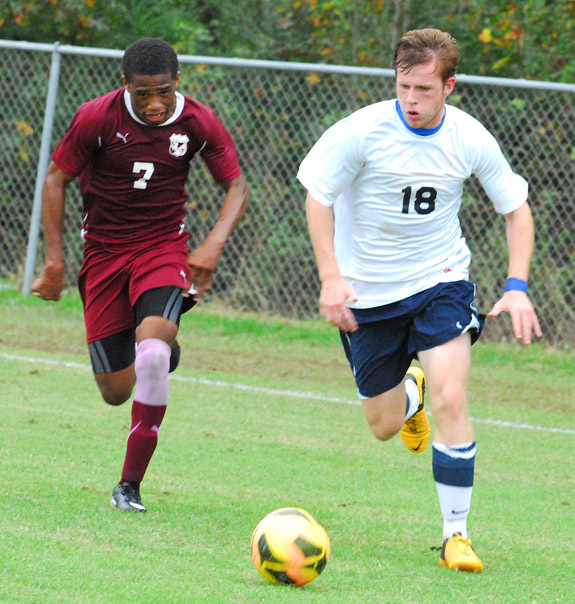 LOUISBURG -- One of the top threats for the National Junior College atheltic Association Men’s Soccer Championship isn’t even ranked right now. And in a way, that’s how Louisburg College coach Cristian Neagu likes it. Louisburg had to forfeit six matches earlier in the season after inadvertently using an ineligible player. LEFT THINKING FOR LC. 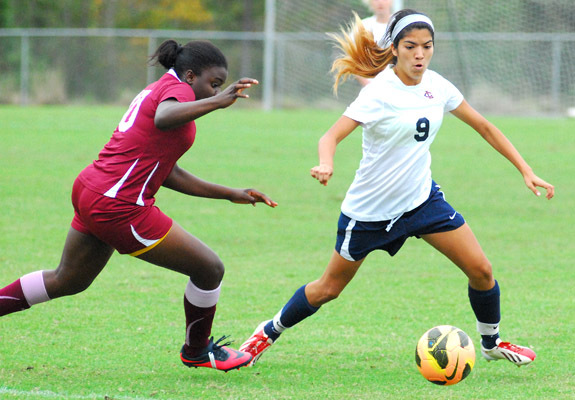 Louisburg College’s Kim Olvera (right) moves to her left and finds an opening during last Saturday’s home soccer victory against Region X rival University of South Carolina-Salkehatchie. 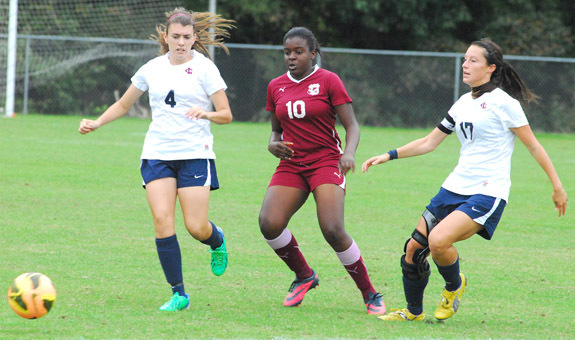 LOUISBURG -- A recent string of injuries has provided a temporary detour on Louisburg College’s road to defending its Region X Women’s Soccer Tournament Championship. Leading the region regular season standings for the entire year, the Lady Hurricanes slipped into a tie for first place following a campaign-closing loss Tuesday at home to Cape Fear. 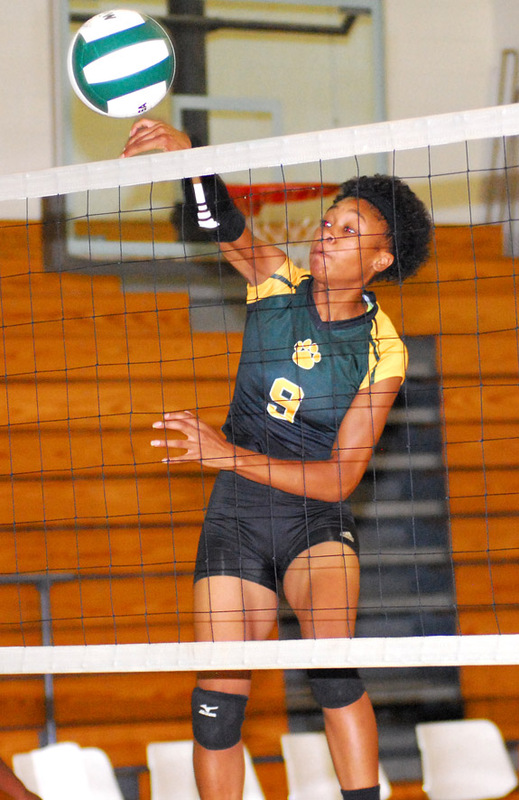 DEEP RUN -- The road has been kind to the Bunn Ladycats in the first two rounds of the Class 2-A State Volleyball Playoffs -- a trend Coach Henry Jones hopes will continue today. That’s when BHS will travel to Henderson for a third-round matchup against a familiar foe -- Northern Carolina Conference rival Southern Vance High School. FORWARD MOTION. 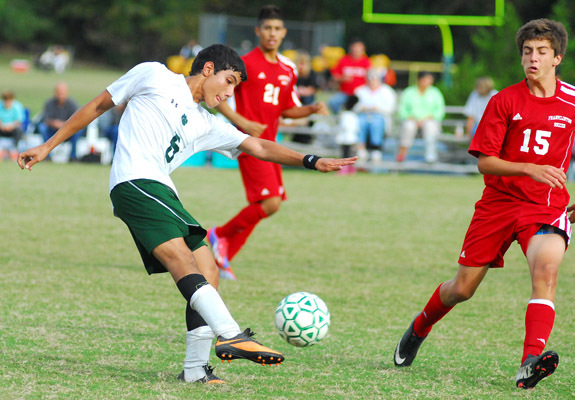 Bunn’s Gabe Gonzalez sends the ball upfield during last Wednesday’s home conference matchup against rival Franklinton. FRANKLINTON -- It doesn’t matter what the sport is, all coaches want their team to be able to control its own destiny as a season winds down. 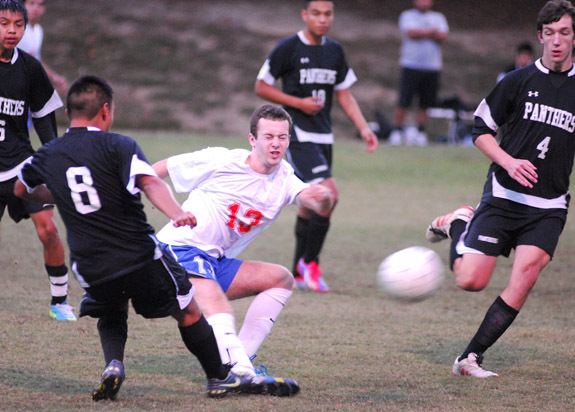 Franklinton High School’s boys soccer squad, guided by Isaac Welker, was in that position Wednesday when the Red Rams hosted North Carolina School of Science and Math in the regular season finale for both clubs. BUNN -- It wasn’t Bunn’s prettiest performance of the season, but it was still enough to keep the Wildcats undefeated in Northern Carolina Conference gridiron action. Bunn erupted for 21 points in the second stanza and went on to defeat Roanoke Rapids by a 28-18 margin last Friday in a key NCC showdown at the BHS Football Field. EDWARDS IN THE FOLD. 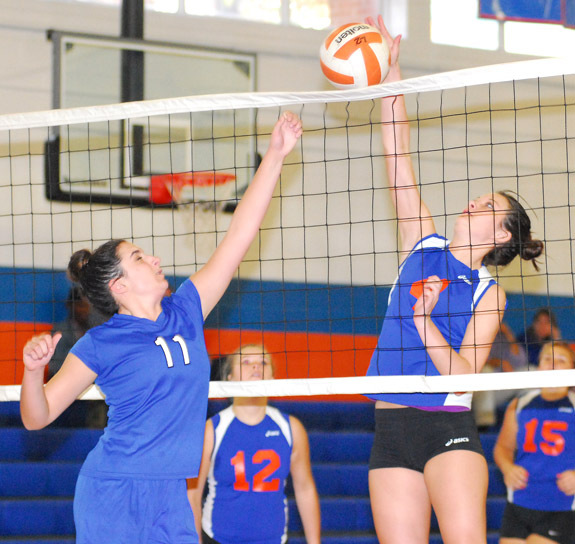 Jordan Edwards’ (right) return to the lineup following an injury helped the Louisburg Lady Warriors put together a strong second half during its 2013 volleyball season. LOUISBURG -- Using short-term memory, it was easy to feel disappointment after Louisburg High School’s volleyball season came to an end Tuesday night at home. Certainly, there were no smiling faces after the Lady Warriors were eliminated by Wallace-Rose Hill in the second round of the Class 1-A State Playoffs at the LHS Gymnasium. 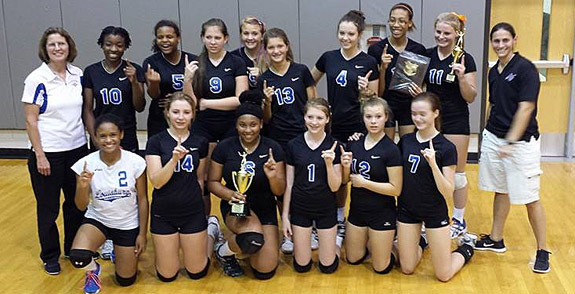 STEM -- Much more than just bragging rights was at stake last Wednesday when Louisburg traveled to Granville Central for the championship match of the Tar-Roanoke Athletic Conference Volleyball Tournament. The clubs split their two matches in the regular season, and Wednesday’s victor was destined to be crowned the TRAC Champs -- along with earning the league’s No. 1 seed for the Class 1-A State Playoffs. JUST A LITTLE MORE. 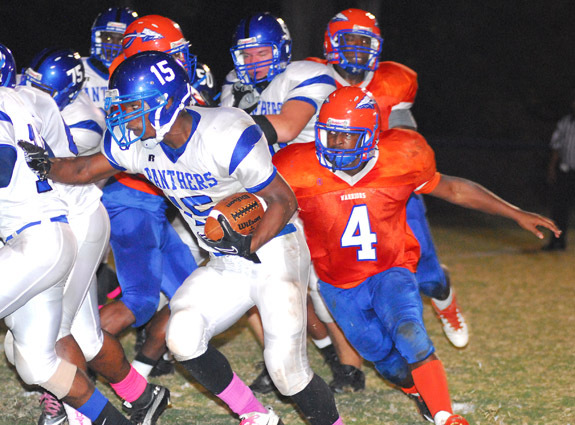 Louisburg High School running back Antonio Smith (left) leans forward to gain a few extra yards during last Thursday night’s home football victory against KIPP Pride. LOUISBURG -- Even with a comfortable lead, there was a measure of frustration on the Louisburg High School sideline during last Thursday’s Tar-Roanoke Athletic Conference football meeting with KIPP Pride. 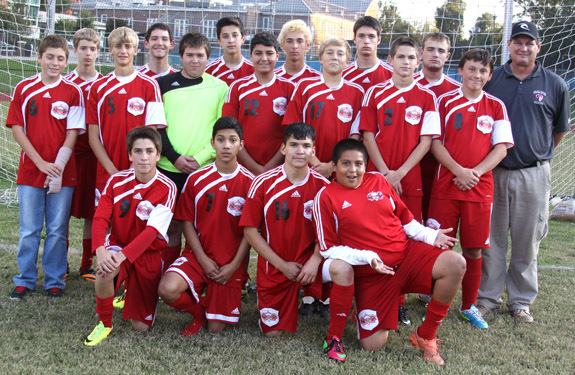 FRANKLINTON -- Franklinton instituted a junior varsity boys soccer program several years ago long before some of its area competitors came up with the same idea. The idea was simple -- give younger players the opportunity to see on-field action when older performers were blocking their path on the varsity. LUCKY 13. Louisburg High School’s Samuel Chmurovic (right) delivers the ball upfield during Tuesday evening’s key Tar-Roanoke Athletic Conference boys soccer event against Granville Central. LOUISBURG -- After falling at Granville Central earlier in the season, Louisburg High School’s needed to win Tuesday’s rematch in order to gain at least a share of the Tar-Roanoke Athletic Conference boys soccer championship with the Panthers. Things certainly looked promising early on for the Warriors, who have continued to improve as the season has progressed. Louisburg College’s Daren Doyle (right) makes a strong move into scoring position last Saturday afternoon. 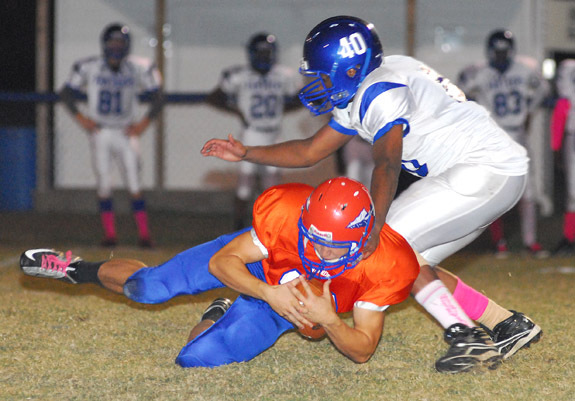 Louisburg High School quarterback Caleb Allen (left) falls on a loose ball during the Warriors’ home football decision last Thursday night against league rival KIPP Pride. Franklinton’s Derryan Henderson (left) breaks a tackle and heads upfield for a nice gain during last Friday night’s road football triumph at Warren County. Louisburg College women’s soccer players Samantha Calvery (left) and Samantha Parrish (right) surround Salkehatchie’s Shayne Smith during last Saturday’s match at May Field. 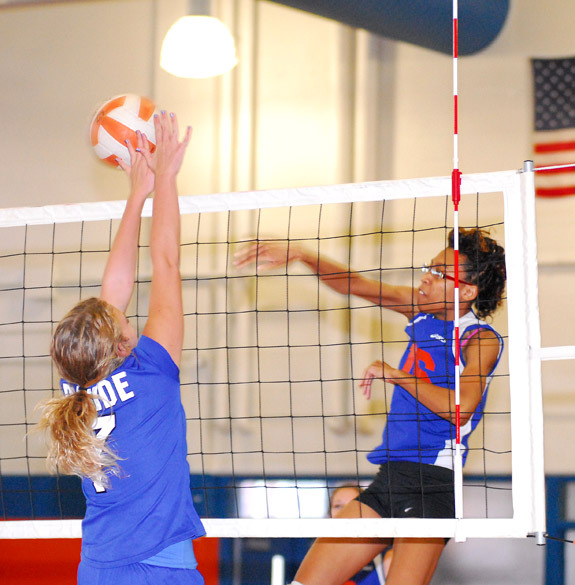 Louisburg High School’s Vanisha Wilshire (right) was saluted as the Tar-Roanoke Athletic Conference Volleyball Player of the Year after helping the Lady Warriors to a share of the league’s regular season title -- and the tournament championship. 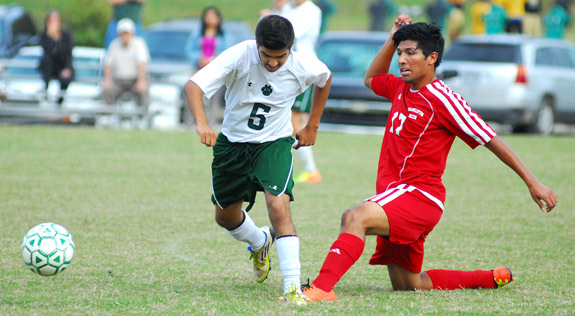 Franklinton’s Josh Ortiz (right) sends the ball away from Bunn’s Christopher Guzman during last Wednesday’s Northern Carolina Conference boys soccer matchup at BHS. 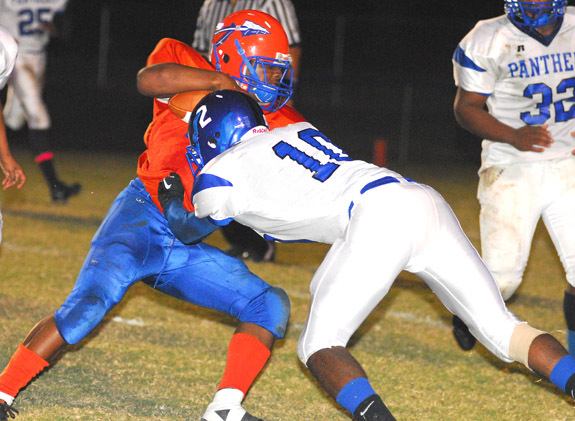 Louisburg’s Antonio Smith (right) prepares to tackle KIPP Pride running back Larry Cotton during last Thursday’s conference football showdown at LHS’ Patterson Field. Pastures can be of great value to owners of most animals, especially ruminants and equine. They supply an important source of nutrition, a place to exercise, help control erosion and can be a source of pride and beauty to the owner. It is all about what nature intended, naturally converting sunshine to grass to a source of protein humans can consume. What are next steps for Tar River Center? The response has been impressive. On Sept. 19, some 62 citizens of Franklin, Granville, Vance, and Wake counties came to a planning meeting in Louisburg, where they shared their ideas about the future of the TRCHC and about the importance of history and culture in general. Incorrectly or not enough watering for indoor plants accounts for a large percentage of plant losses. A variety of personnel-related decisions were made by the Franklin County Board of Education during its October meeting. LOUISBURG — All but one of the suspects arrested in an attempted murder case are slated to appear in court this month. 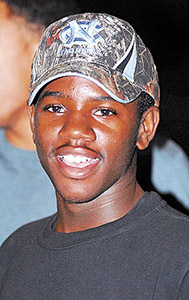 Jamacies C. Perry, 20, of Louisburg last appeared in court on Sept. 16, but his matter was continued. The cases against the remaining suspects, Jarvis L. Powell, Youngville; Tevin J. Arrinton, Darrell T. Green, Deshawn Conyers and Vernon Hicks, all of Louisburg; and Maleak A. Yancey and Tavain Hicks, both of Oxford, are scheduled for case management court on Oct. 30. FIRST-EVER AWARD. 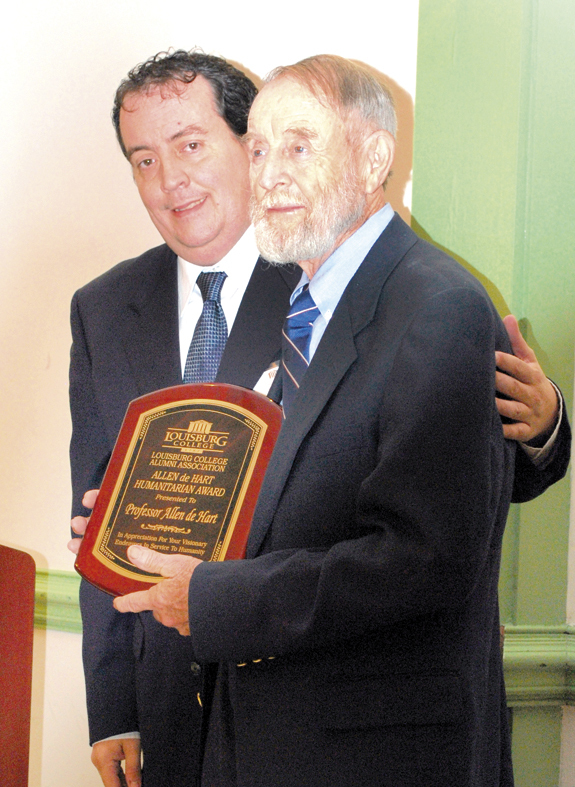 Allen de Hart (right) receives Louisburg College’s first-ever Allen de Hart Humanitarian Award, presented by alumni board president Alex Cheek, class of 1994. LOUISBURG — Thomas Wardrick, and Allen de Hart, both of Louisburg, were honored recently with two of Louisburg College’s alumni awards. Thomas Wardrick received the Henry Douglass “Doug” Lindsay III ’66 Young Alumnus Service Award, given to an alum who has graduated within the past 20 years and demonstrated extraordinary service to the College through the commitment of time and effort on its behalf. OFFERING ASSISTANCE. 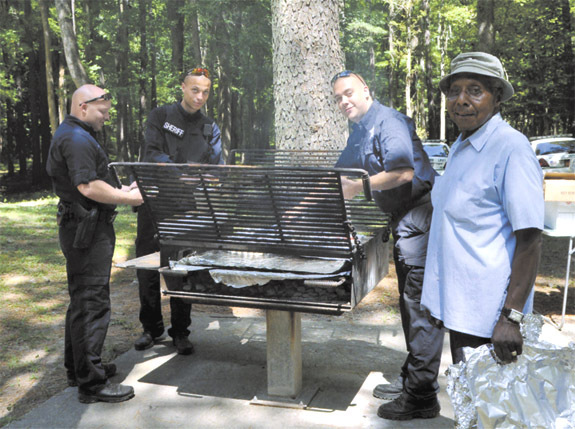 From the left, John Wells, Antoine Eaton, Matthew Tharrington and Luke Bailey provide help during at the recently held FCTS/Riverside Alumni Association fundraising event at River Bend Park in Louisburg. The FCTS/Riverside Alumni Association recently held its first fundraising event at River Bend Park in Louisburg. This was a chance to reconnect with schoolmates and keep high school memories alive. 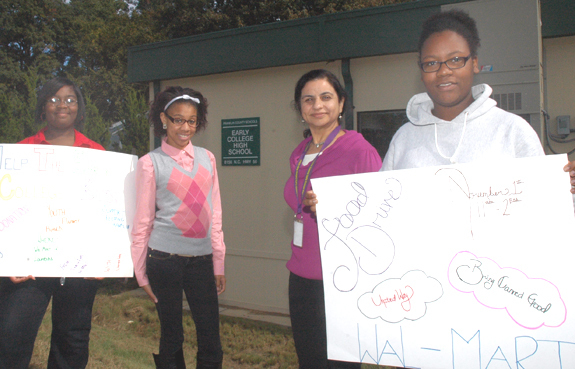 Tables were set up in flea market style with items such as books, shoes and household items for sale. LOUISBURG — The United Way of Franklin County will be relying on new partners and new ideas to bolster their food drive this fall and beyond. The organization’s Feeding Franklin food drive begins on Oct. 28 and will run through Nov. 15, giving people in the community a chance to donate food items to those in need. LOUISBURG — A Franklin County man was arrested on Monday, two days after investigators allege he shot his stepfather. The injuries to Anthony Davis were not life-threatening. Alphonso Jermaine Kingsberry, 27, was charged with assault with a deadly weapon with intent to kill inflicting serious injury. St. Paul Child Care Center in Louisburg has announced its recent accreditation by Better Business Bureau serving Eastern North Carolina. “We are proud to have met Better Business Bureau’s high standard and we are excited to be part of an organization that exists so consumers and businesses have an unbiased source to guide them on matters of trust,” said Patricia Privette, center administrator.